It might be slightly too expensive, but the keyboard is a really great way to type and is every bit as good as a full-sized model would be. The battery lasts a decent amount of time and the backlight is solid. Well worth considering. Despite the fact that touchscreens are becoming ubiquitous, it seems as if a keyboard is still an essential part of life. There has yet to be a tablet or phone that feels as good, or allows you to type as fast, as you would be able to on a full Qwerty keyboard. So when it comes to working on your new device, if you want to do any volume of writing, then you'll need a way to type. 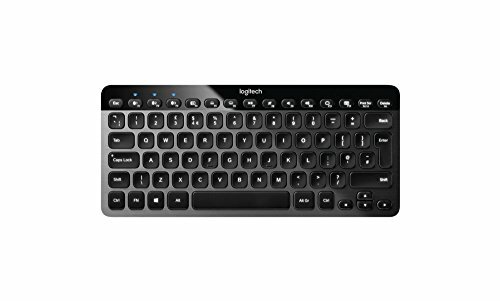 With that in mind we got hold of the Logitech K810 and started typing. The question is, will it help or hinder your typing efforts. Aesthetically, the 810 is rather lovely. It's made of several different materials. There's a metal surround to the island-style keys as well as a plastic strip at the top which contains the function keys. It lies quite flat on your desk, and it's small and compact giving you about the same sized typing surface you'd find on a 15-inch laptop. This might not sound like a lot, but the low profile design means that it's actually a lot nicer to type on than a laptop, and can be more sensibly positioned than a portable computer would, if you needed to both type and see the screen. There's no removable battery here either. The power pack is built-in, and needs to be charged via USB socket located on the back of the keyboard. Once charged, it lasts ages.To get started, just turn the keyboard on, and start the Bluetooth pairing process with your computer. One of our very favourite features has to be the hand-proximity detector. It's firstly a good idea to have the keyboard dim itself to save power when you're not typing, but it's an even better idea to have it able to sense when your hand approaches the keyboard. We have no idea how Logitech does this, but it seems really difficult to sneak up on the keyboard without it illuminating itself quickly, and before you actually need to start typing. It's clever, and well executed. When we started using the 810 with our XPS 13 and we noticed an interesting problem. Often, we'd start typing and the first letter in our sentence would be missing. We assumed that this was a problem with the keyboard perhaps not coming out of standby properly. It only happened when the backlight has been turned off, so when the keyboard had been idle. That problem carried on, and we felt that perhaps the K810 wasn't very good, and didn't deserve a very high score. By pure chance though, we used it with another laptop - a Dell again - and found that the keyboard worked perfectly. We had not seen another other Bluetooth problems with the XPS 13, so it's odd that the two don't work brilliantly together, but it could point to a minor, and likely simple-to-fix problem in a driver somewhere. But the way the keyboard worked with our other laptop means that we're satisfied that it's actually a very capable peripheral. And that brings us to how it works. We have to say, we like it a lot. The battery seems to last ages, which is handy because we've carried it about whenever we've needed to work on a laptop for any length of time. Most importantly, the typing. Here, where it needs to be, the K810 is strong. All the keys work with minimal fuss - that sounds standard, but we test a lot of keyboards, and we've seen all sorts of strange key-based absurdity. Typing can also be done quickly, with great accuracy. We didn't notice any real slowdown between the 810 and our full-sized keyboard. Indeed, much of this review was written on the K810, including some of the words that are spelt correctly. We liked the backlight, it's bright enough to let you see what you're doing in subdued conditions, but not so bright as to be overwhelming - our laptops all seem to want to give the sun a run for its money in brightness. Getting set up was nice and easy too. Logitech allows you to pair the keyboard with three separate devices. These can then be mapped to one of three function keys. The idea here is, if you need to carry your phone and your laptop, it's possible to just switch from one to the other, without the need to pair and unpair. It's a nifty idea, and it works well enough as long as you don't press the button by accident. All in all, it's the K810 is compact, easy to use and well-designed. It's got decent battery life, and is incredibly easy to recharge even when it does run down - as long as you've got a USB charger, but in this day and age, you don't have to look too far to get such a thing. Performance is great. Our problem with the XPS 13 could be anything, and while we'd like to see Logitech look in to why, the keyboard worked fine with our other laptop, so it's fair to assume the problem affects only a small number of devices. Of course, if your device is in that small number, you'll be cross, so it's probably worth checking, or buying from a shop that will let you return it if you have trouble. It's not all that cheap, but given how nice it is to type on, and how good the battery is, and how nice the backlight is, we think it's justifiable. You may not agree, but that's between you and your bank account. Either way, this is the best compact and portable keyboard we've used for a long time, and it gets our approval.